Following our review of the Galaxy S9 there’s been a lot of discussion about both the performance and battery life of Exynos 9810 variants of the Galaxy S9. In the original review I had identified a few key issues with the platform for which I had deemed to be the most negatively attributing to the bad characteristics of the phone. In a first piece following the review I did a few minor changes to the kernel which already seemed to have benefited battery life in our web browsing test, and slightly changing the performance characteristics of the phone for the positive. In that previous article I noted that there’s a lot to be done to improve the performance of the phone further and trying to optimise battery life. Especially on the performance side of things there were in my opinion very low-hanging fruit in terms of possible changes that would benefit the user-experience. For this second part I set about trying to recover the best performance possible and matching the Snapdragon 845 variant of the Galaxy S9, while still keeping an eye on battery life. As a starting point we’re continuing on where we left off in part 1, which was extremely straightforward as the only changes were the removal of all boost frequencies above 1.8GHz on the M3 cores and disabling the online core / hotplugging driver. In the original review the most evident issue that I identified in terms of badly affecting performance of the phone was the way the device was extremely slow in terms of scaling up in frequency, as well as migrating threads onto the big cores. The original values I described were around 410ms for a steady state continuous workload to actually reach the maximum frequency of the big cores. This was a great contrast to the 65ms of the Snapdragon 845 variant. Setting all other things aside this is what was limiting the interactive performance of the Exynos 9810 the most, so naturally it’s what we want to fix first and foremost. As a little backstory, ever since big.LITTLE’s introduction several years ago the biggest goal for ARM has been to have SoC vendors run the heterogeneous CPUs with a smart scheduler that would be aware of the various CPU’s performance and energy characteristics. This was a fine goal to have but the road to get there has been in my opinion nothing short of a mess. ARM’s approach was to try to do the work in the upstream Linux kernel or within the Linaro workgroup kernel. Unfortunately over the years and delays a lot of the hype that energy aware scheduling (EAS) would bring ended up with a fizzle when it came to shipping commercial devices. I think Qualcomm was on the ball here as even as early as 2015 for the Snapdragon 810, and we’ve covered extensively what the company was trying to do to resolve issues relating to EAS. A key component to enabling scheduling across heterogeneous CPUs is the ability for the scheduler to actually know the activity and load of individual tasks, instead of only knowing the general CPU utilisation. If you know an individual task’s load, then you can make batter scheduling decisions on which CPU cores to place it. This was originally implemented through the PELT mechanism (Per-entity load tracking) into the Linux kernel and is what was used for migration decisions both in HMP and EAS scheduling. Another long-running goal of Arm and the Linux community was to integrate CPU frequency selection logic within the scheduler, instead of it being a separate mechanism. This was first attempted in a project called schedfreq, and is now fully integrated into a new governor called schedutil. Again the implementation time-scale we’re talking about here was several years, while at the same time we’re seeing several device generations being shipped with a myriad of solutions. 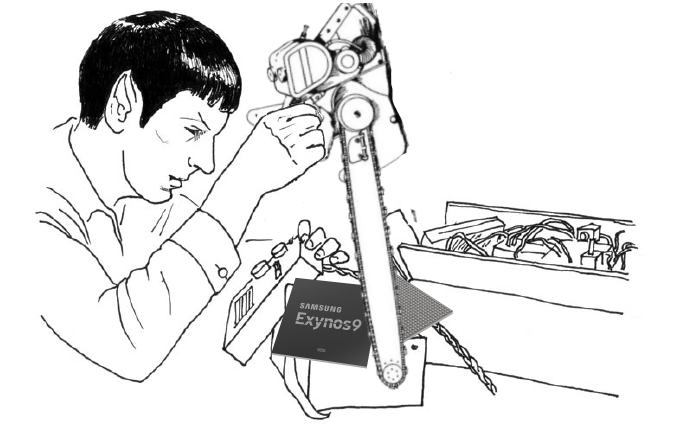 S.LSI’s Exynos chipsets were playing it safe, and up to the Exnyos 9810 the company just chose to stick to a HMP scheduler with a separate interactive cpu frequency governor. Huawei Kirin chipsets ship with EAS, however here even with the latest devices such as the P20, the company foregoes the scheduler CPU frequency governors and falls back to a traditional interactive one (with very good results). Meanwhile Qualcomm has advanced their custom implementation and taken another approach called WALT (Window-assisted load tracking) that is far more responsive to PELT. On the Snapdragon 835 and 845 this is the core mechanism that assures the best performance in terms of scheduling and CPU frequency selection. Andrei was working for ImgTech if i'm not mistaking. 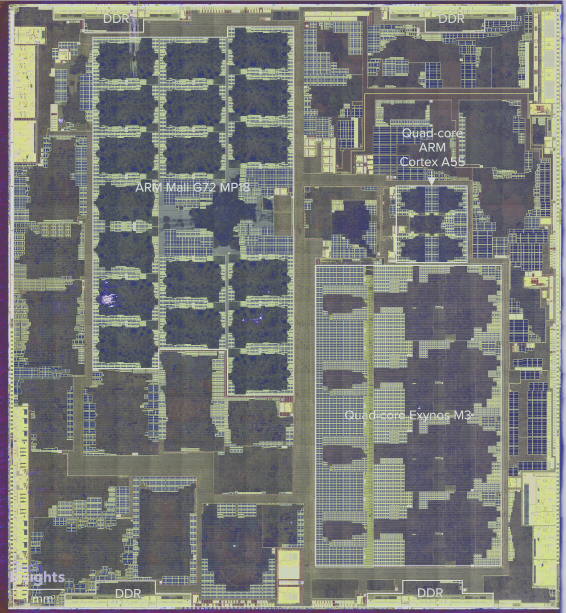 Unfortunately since Apple move ImgTech without MIPS I dont't think will ever come out with a SOC. Real one not just on paper. My strong guess is that Samsung has the same idea that Apple has for its future MacBooks - Intel outside. In mobile systems (phones), well executed hardware and software designs of wide and deep cores (Apple: yes, Samsung: not really) can offer great peak performance but have to throttle heavily due to thermal and power constraints. Same core designs in a laptop with good heat management and a much larger battery, those restraints are loosened significantly. Samsung's attempt failed mostly due to their typical report card - hardware: A- or B+, software: D or F.